The Caribbean Writer is seeking works that explore the defining moments of the Caribbean experience, the symbolism in the places that dot the Caribbean landscape, the journeys that inform our experiences, the memories that will not let us go. We hope to highlight and document Caribbean life in its broadest sense. We also invite works that provide a critical and historical overview, of times, places, and memories that reflect the wit, resilience and resourcefulness of Caribbean people as well as the implications of certain periods that have helped to define the notion of the contemporary Caribbean. Major events in the history of the Caribbean and the experiences of people wherever they live the Caribbean experience is relevant in very profound ways. Memories of these events are meaningful not only because they provide fodder for introspection and change, but also because their implications are articulated on a number of levels. 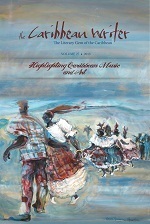 Memories of natural disasters, calamities, migrations, pivotal national decisions, national movements, societal trends, populations shifts, alienation issues, economic swings, internal struggles, and survival strategies ripple through the diaspora and have had such an impact on people that they possess an abiding ability to elicit passionate responses that can create new rifts or forge new alliances.